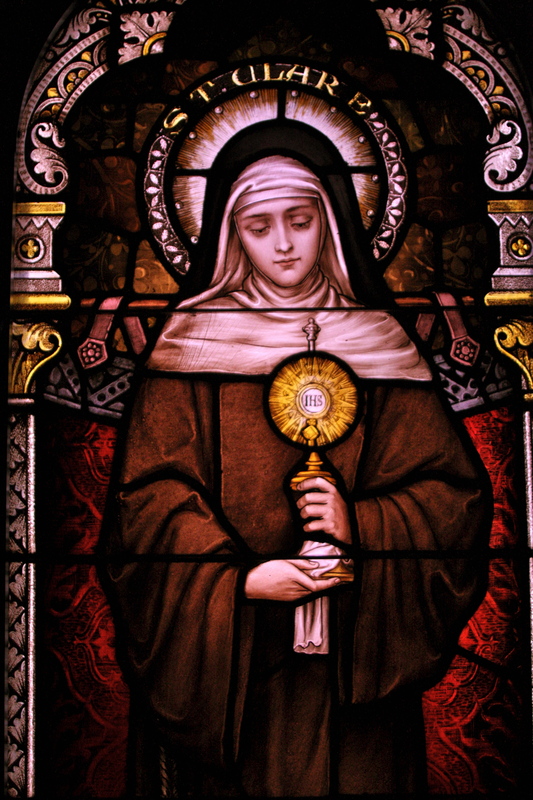 August 11: ST. CLARE OF ASSISI. St. Clare (1193-1253) followed the footsteps of her brother, St. Francis of Assisi, especially in the way St. Francis lived the virtue of poverty; she was remarkable for her penitent life. She founded the Order of the Poor Clares. “Clare was a beautiful Italian noblewoman who became the Foundress of an order of nuns now called “Poor Clares.” When she heard St. Francis of Assisi preach, her heart burned with a great desire to imitate Francis and to live a poor humble life for Jesus. So one evening, she ran away from home, and in a little chapel outside Assisi, gave herself to God. St. Francis cut off her hair and gave her a rough brown habit to wear, tied with a plain cord around her waist. Her parents tried in every way to make her return home, but Clare would not. Soon her sister, St. Agnes joined her, as well as other young women who wanted to be brides of Jesus, and live without any money. St. Clare and her sisters wore no shoes, ate no meat, lived in a poor house, and kept silent most of the time. Yet they were very happy, because Our Lord was close to them all the time. Once, He saved them from a great danger in answer to St. Clare’s prayer. An army of rough soldiers came to attack Assisi and they planned to raid the convent first. Although very sick, St. Clare had herself carried to the wall and right there, where the enemies could see it, she had the Blessed Sacrament placed. Then on her knees, she begged God to save the Sisters. Dear friends, through the intercession of St. Clare, let us ask God for the holiness and perseverance of all the consecrated women in the Church and for vocations to the consecrated life. Without the virtues of poverty and detachment, we are enslaved by the worldly material goods, converting them into ends, instead of being means to live a decent life according to our state in life and for love of God and of others. August 10: ST. LAWRENCE, DEACON, AND MARTYR. Patron Saint of Cooks, Chefs and Comedians. Short bio. Exemplary life of St Clare, we pray we will also live simple lives so that others may simply live ! Grant us O Lord the grace to detach ourselves from worldly cares and things!